Maybe you have seen them over by the cow pasture or have seen the smoke cloud indicating the beekeeper is in. Maybe one of the “residents” has buzzed past you. The beehives at Frying Pan Farm Park don’t get a lot of visitor attention, and it’s no wonder; bees are bees! But the bees and their beekeeper at Frying Pan play a vital role in the community and on the farm. John Fraser from Highland Honey and Apiaries in Northern Virginia has been tending 10 to 15 honeybee hives at Frying Pan for about eight years. A fourth-generation beekeeper, Fraser and his family preserve traditional, small scale beekeeping where all the work is done by hand. Beekeeping once was a common part of small Virginia farms. In Frying Pan’s heyday, there were more than 100,000 hives kept on Virginia farms. Now only a handful remain in the county, making Fraser’s beehives an integral part of the authentic, working 1920s-1950s era farm. Although most beekeeping techniques and equipment in Virginia have been the same since about 1870, there have been changes to adapt to new diseases, parasites, and predators. In the late 1980s, a destructive mite from China killed numerous wild honeybee colonies in the U.S. Since then, farmers who need honeybee pollination have depended on beekeepers like Fraser who maintain hives and protect those hives from the mite. Without his stewardship, Frying Pan’s honeybees might not survive to provide free pollination services to all the yards and gardens near the beeyard, including some of Frying Pan’s crops. Rare comb honey sells quickly. Fraser’s family business sells two types of honey, both available for sale at the Frying Pan Farm Park Country Store. Comb honey is cut directly from the frames that hold combs in the hives and placed in jars filled with liquid honey. Beekeepers don’t often make comb honey since it involves removing some of the bees’ valuable real estate. Comb honey is rare and usually only available immediately after the mid-summer harvest. According to Fraser, Highland’s comb honey “is snapped up by savvy buyers as soon as it hits the shelves.” More regularly available for sale is liquid wildflower honey, which is extracted by spinning an entire frame of honeycomb and then coarse-filtered. Author Cate Henderson is the marketing and development assistant at Frying Pan Farm Park. 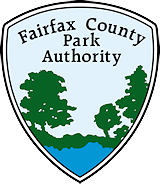 This entry was posted in Uncategorized and tagged Beekeeper, Frying Pan Farm Park, Honey on May 28, 2014 by Fairfax County Park Authority.